ABC (Alvechurch Boat Centres) Leisure Group ……. Simply beautiful boats. Sleep easy knowing your dream is in the hands of people you can trust. ABC Leisure Group have been building high quality narrowboats for over 30 years. These boats have been designed and refined to meet the demands and requirements of many different customers which, along with our experience of operating them in a hire fleet provides first hand information about durability, reliability and ease of maintenance. Click here to see some of the beautiful boats we have built recently. We build all our own shells in house. We are also specialists in building the Eco-hull which will appeal to those interested in protecting the environment. All our boat fitting out is done by our own craftsmen using only the highest quality materials. Sailaways - We can build to any stage or design and can offer a wide variety of options to our customers. It is this knowledge and experience that helps us provide a full boat building service, we can offer advice and technical knowledge on all aspects of narrowboat building to turn your dream into a workable, and practical boat that will give many years of pleasure. We build our own shells before completing all aspects of the boat fitting with our own craftsmen using only the highest quality materials. 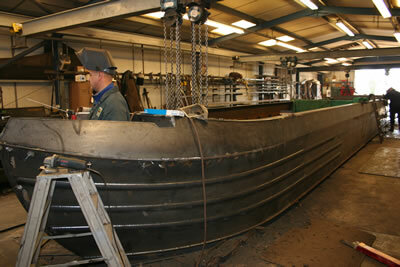 We can therefore build any design or specification from a bare steel shell to a fully fitted luxury narrowboat. Each boat is designed with the customer to meet their specific needs. It will be built to the European Recreational Craft Directive and under a British Marine Federation contract for your protection. If you would like more information, or would like to visit us at Alvechurch to see work in progress and discuss your new boat, please contact us to arrange an appointment. Alvechurch are specialists in building the Eco-hull which will appeal to those interested in protecting the environment. This recently developed underwater hull shape is the result of a number of years research by a Scottish university, financed by British Waterways and built by Alvechurch Boat Centres. 15% - 30% less bow wave. 5% - 10% smaller stern wave. Up to 40% less pressure disturbance on the canal bottom, which results in less environmental harm to plant, fish and animal life living in canal waters. Because of reduced resistance of the hull, a smaller engine can be used giving the bonus of less fuel consumption and reduced exhaust gas emissions. ABC Leisure build boats both at Alvechurch Marina on the Worcester Birmingham canal in Worcestershire, and at Hilperton Marina on the Kennet & Avon in Wiltshire.